Mini speakers at a tiny price! Whether you need to keep your music-making setup portable or are just really short on space, IK Multimedia's iLoud Micro Monitor has always been a great option. However, with the price now slashed by $100 to $199.99, this two-speaker setup is an even better deal. 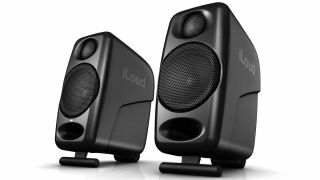 Said to be "the smallest studio reference monitoring system in the world," the iLoud Micro Monitor comprises two bi-amplified speakers that deliver 50 watts RMS of power. Each speaker contains a 3/4-inch silk dome tweeter, a 3-inch paper cone performance woofer and a large flaring front-firing bass reflex port. We're big fans of these little speakers, and at this price, they're a bit of a steal.